Additionally, Right Relevance provides an Insights offering that combines the above Topics and Influencers information with real time conversations to provide actionable intelligence with visualizations to enable decision making. The Insights service is applicable to events like elections, brands, emerging technologies, issues/activism, conferences, product launches etc. 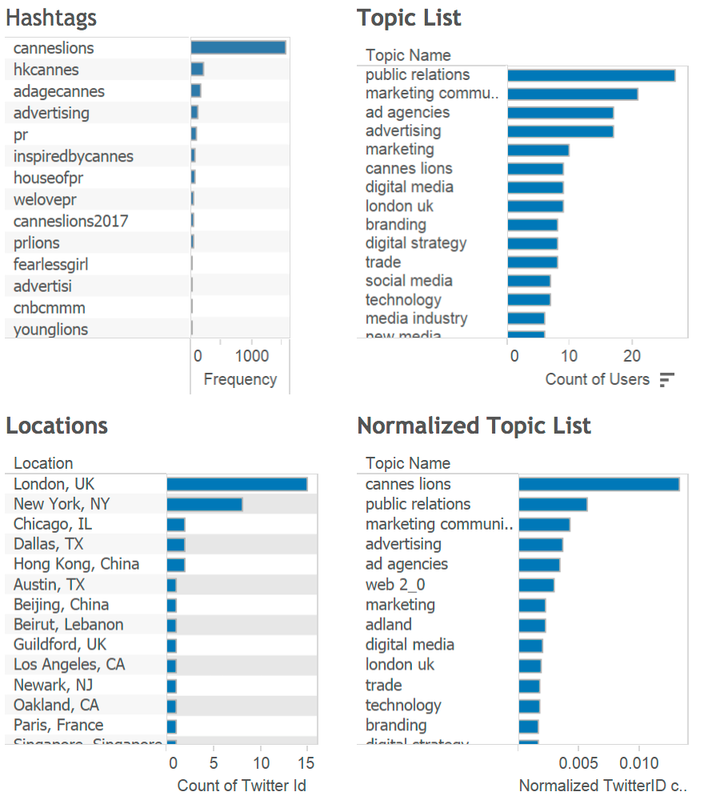 This report is a summary of graph analysis of engagements and conversations including retweets, mentions and replies of related to Cannes Lions 2017 from June 17th to June 24th. The report leverages tweets sampled from June 17th to June 25th 2017 and along with Right Relevance topics, topical communities’ and articles data form the basis for the analysis. For access to Tableau and the complete graph please send email to biz@rightrelevance.com. 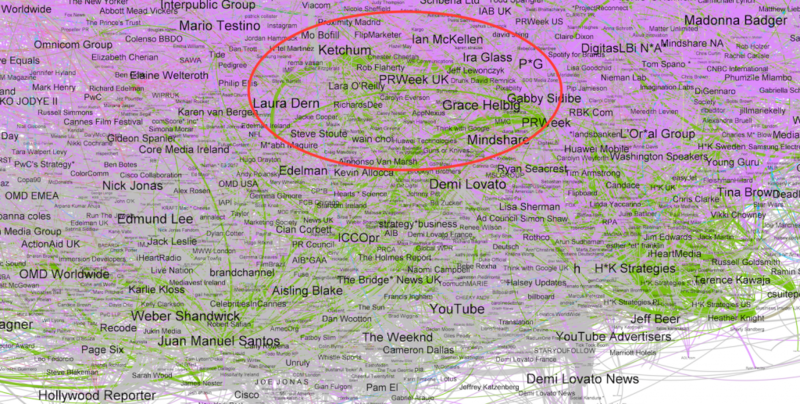 Overall conversation map which includes mentions, replies, retweets, quoted tweets looks like this. For Zoomable clickable link here. Even with this small volume of tweets there are clear patterns and communities visible and some very obvious early ‘performers’ beyond the obvious ones who get the vast majority of the official publicity. 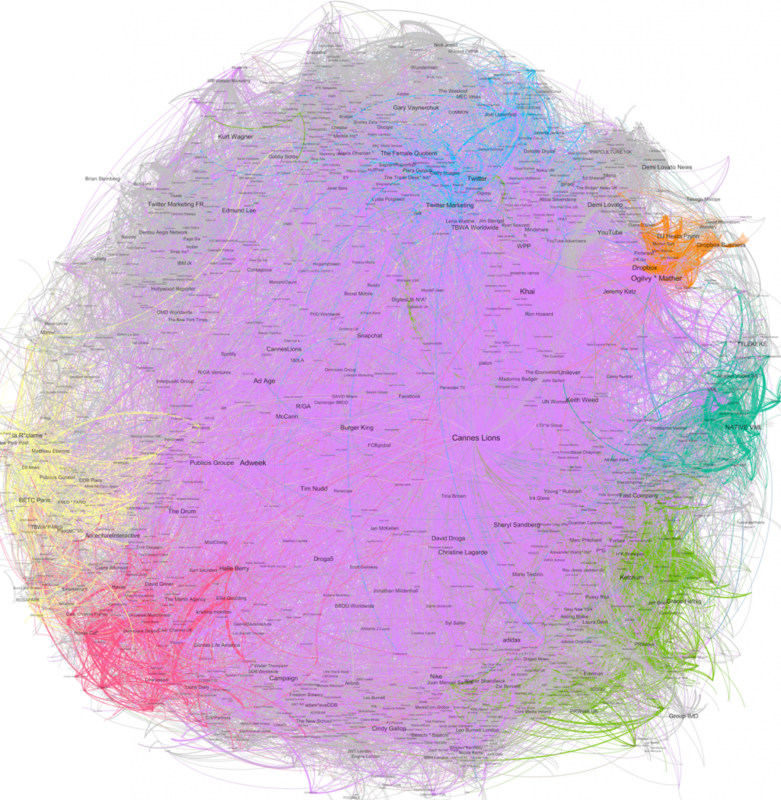 The Retweets-only graph shows the most important user accounts more clearly. If we leave the main Cannes_Lions user account in the graph, it totally dominates the conversation. We can correct for this kind of effect by excluding the account from the graph. The top 3 tweets show heavy and successful engagement by Ogilvy at Cannes Lions. ‘Cannes Lions’ is a structured topic in the Right Relevance platform with the following metadata (fig 3) returned by the RR Topics Metadata API of the RR API offering. The top related topics include ad agencies, advertising, adland, ad networks, chief marketing oficer, marketing communications, creative directions, digital strategy and public relations. 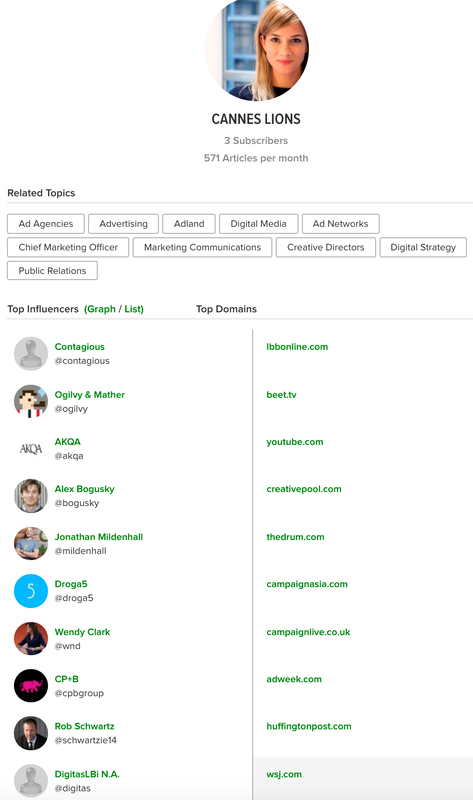 Fig 3 also provides a list of the top 10 Right Relevance ‘Cannes Lions’ Tribe influencers including Contagious (@contagious), Ogilvy & Mather (@Ogilvy), AKQA (@AKQA), Alex Bogusky (@bogusky), Jonathan Mildenhall (@Mildenhall) along others. The top 10 domains where influencers post about ‘Cannes Lions’ include ibbonline.com and beet.tv. Right Relevance ‘engagement influence’ measures are calculated by applying a set of graph analysis algorithms, including PageRank and Betweenness Centrality. The quality and quantity of engagements (RTs, mentions, replies), reach of tweets etc. are measured within the context of a subject (event, trend etc.). to measure Flock influence. The meaning of rankings within this methodology are documented at Twitter Conversation Performance Measures. The first two lists (fig 4) are of the top 30 accounts by Overall & PageRank measures. Overall rank is an ensemble normalized rank to reduce the skew towards users with large numbers of followers or a single tweet having a large number of engagements/RTs (often referred to as becoming ‘viral’). 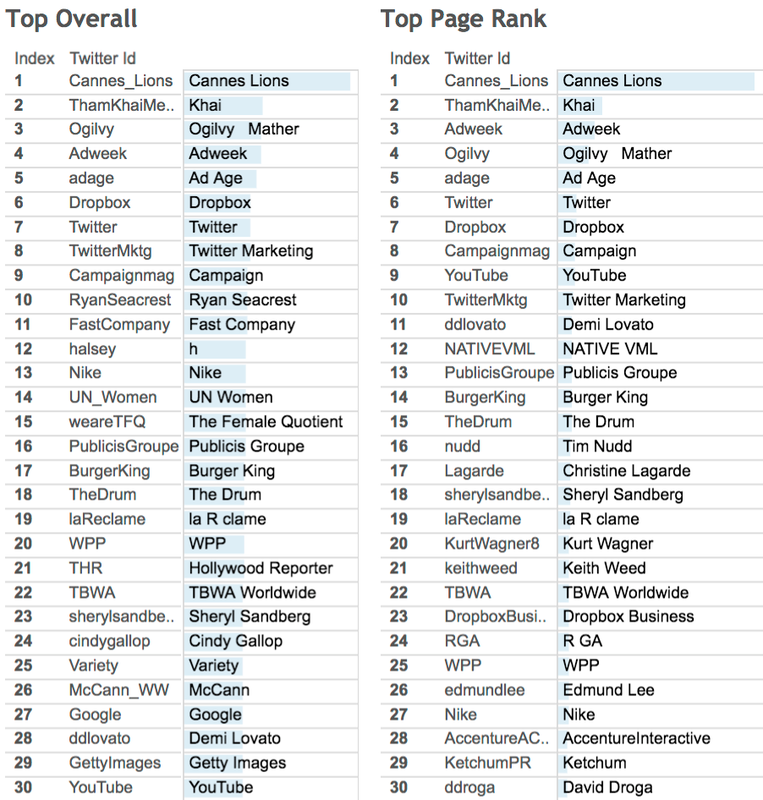 Unsurprisingly, Cannes Lions (@Cannes_Lions) is the top by both PageRank and Overall measures. Khai (@ThamKhaiMeng), Adweek (@Adweek), Ogilvy & Mather(@Ogilvy) and Ad Age (@adage) round up the top 5. Twitter (@Twitter) and Twitter Marketing (@TwitterMktg) figure among the top 10 as Twitter engaged heavily (#twitterbeach and #twitterterrace among top hashtags) and won the Grand Prix for traditional outdoor. Dropbox (@Dropbox) also is among the top 10 as it sponsored Cannes Lions. Among non agencies, Ryan Seacrest (@RyanSeacrest), Demi Lovato (@ddlovato), Christine Lagarde (@Lagarde) and Sheryl Sandberg (@sherylsandberg) feature among the top. One of the most reliably useful and interesting measures is ‘Top Connectors’. Fig 5 shows the top 30 accounts by this measure, which is on ‘Betweenness Centrality’ algorithm. Betweenness centrality, which is a measure of the degree to which a node forms a bridge or critical link between all other users. We use this as a measure of influence wrt value in being information and/or communication hubs. Cannes Lions (@Cannes_Lions) is again the top account. 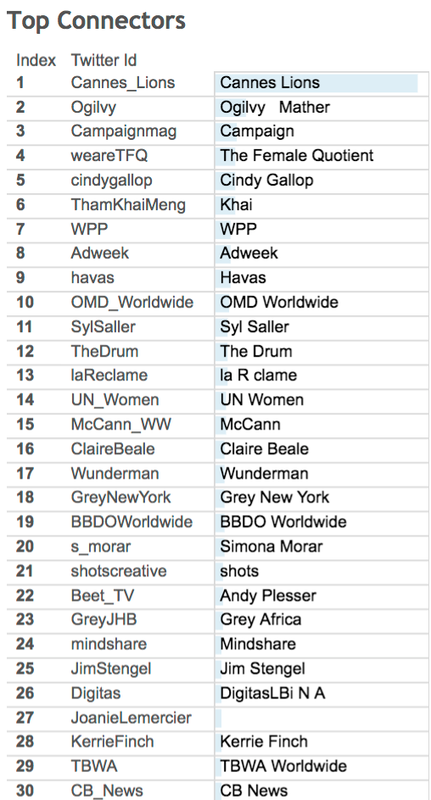 Ogilvy & Mather (@Ogilvy) and Khai (@ThamKhaiMeng) are among the top 10 again as Ogilvy engaged heavily and successfully. Campaign (@Campaignmag), The Female Quotient (@weareTFQ), Cindy Gallop (@cindygallop), WPP (@WPP), Adweek (@Adweek), Havas (@havas) and OMD Worldwide (@OMD_Worldwide) round up the top 10. Flocks generally align well with the subgraphs aka communities noted in the graph. 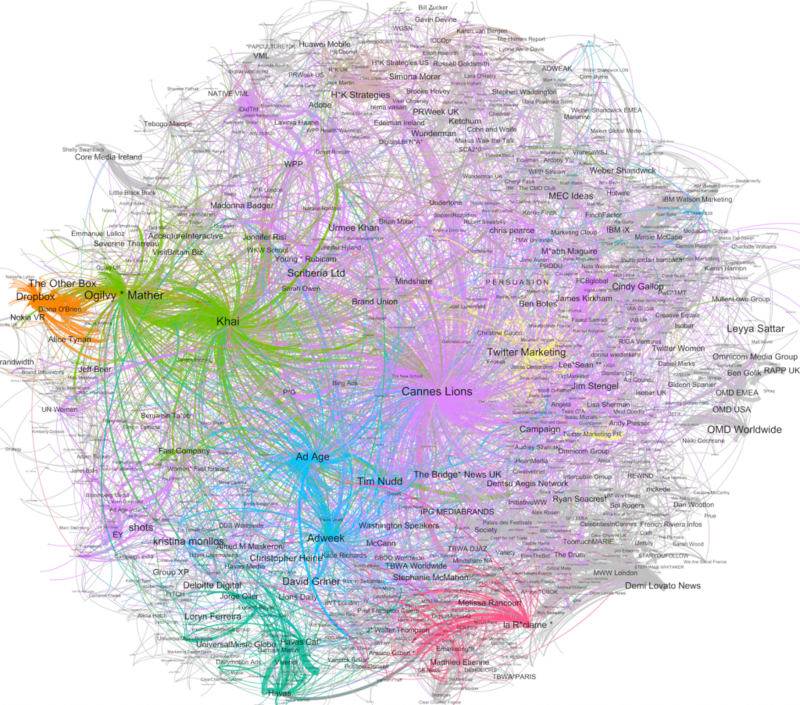 As seen in the all engagements and RTs-only graphs (Fig 1 & 2), there is one primary user account in the center with overwhelming engagement with several active smaller inter-connected communities on the edges of the circle. Note: Flocks are named after the account with the highest PageRank in the flock. Some interesting flocks are outlined below. The 1st flock, tagged ‘KetchumPR’, looks highly PR and marketing communications focused as is obvious from hashtags like #pr #houseofpr #welovepr #prlions and RR topics like ‘public relations’, ‘marketing communications’. London and New York City are the top 2 locations for this flock. Ketchum (@KetchumPR), Laura Dern (@LauraDern), Grace Helbig (@gracehelbig), Huawei Mobile (@HuaweiMobile) and PRWeek UK (@prweekuknews) form the top 5 users of this flock. The flock can be visualized in the graph snapshot below.